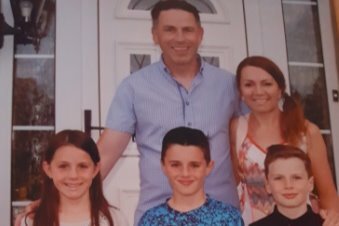 My name is Brian Farrell and I live in South Wales, with my wife Nicola and our three children, Conor 12, Calum 10 and Erin 10. 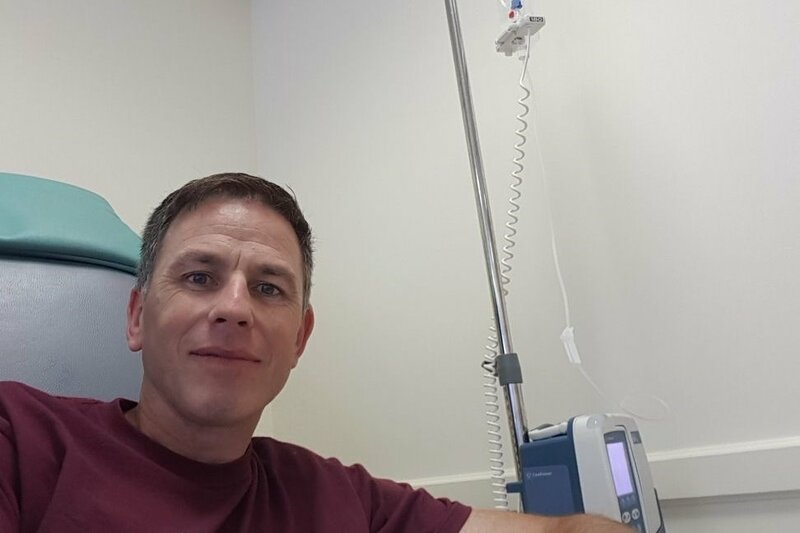 At 40 years old, I was diagnosed with Pancreatic Cancer which has now spread to my liver. I need to raise money to allow me to have my tumour genetically profiled, which may then allow me to find life-extending targeted cancer drugs that are not yet available on the NHS UK. Prior to this, I was an active guy. I was working as a mechanical fitter and enjoying family life. In November 2016, at the age of 39, I found myself in agony with abdominal pains, which did not seem normal. I was rushed into A&E, whereby from routine blood tests, they diagnosed me with Pancreatitis. What unfolded in the next few days was life changing. From x-rays, ultrasounds and CT’s, they confirmed there was a tumour on my pancreas. However, at this point, we did not know if the tumour was benign or malignant. On the 1st December 2016, I had a biopsy which would confirm either way. Devastatingly, on Christmas week, we found out that the 4.5cm tumour was malignant (cancerous), and I had a rare form called Acinar Cell Carcinoma (ACC). This only accounts for 1% of all Pancreatic Cancers, but the survival rate was still brutal. On 6th January 2017, I had surgery to partially remove my pancreas (PPPD). After 11 hours of surgery and 18 days in hospital, I made it home to recover. The good news following that was the histology confirmed clear margins and no lymph nodes were affected. However, my Oncologist advised 6 months of 3-weekly infusions of two types of Chemotherapy once my scars had healed, this commenced March 1st to September 2017. It was a tough regime for the 1st 3 months, and then further trauma happened in July with a burst appendix which required emergency surgery. Another scar to heal before chemo could continue, but I did and finished 6 cycles by the end of August. I thought this was the last chemo infusion! At the end of September, it was scan time and my oncologist gave us the news we had been waiting for… CLEAR SCAN, no sign of Cancer. We were delighted, relieved and finally thought we could get on with our lives. We had a relaxing Christmas, but as scans were every 3 months, the worry was never too far away. The next scan was due December, but got delayed until the 31st of January. On 5th February, my oncologist informed me that there was activity on my liver and he would like to send me for an MRI to further investigate. This was the most anxious time, waiting for a date, looking for a private scan. On the 10th February, the MRI confirmed that this activity was indeed cancerous and I now had secondary (i.e., incurable) cancer…. Our world, our family, everything had changed forever. We soon discovered that the prognosis of advanced or metastatic pancreatic cancer is poor, with a median overall survival between 6.8 and 11 months. But being the positive person I am, we decided to follow the advice of the oncologist and start another regime of 6-months of two types of chemotherapy, starting immediately. This was a brutal combination of exhaustion, nausea, sickness, diarrhoea and then hair loss all set in for this bumpy ride. But this chemotherapy is so toxic that even if it seems to be working it is not sustainable longer term, as my body’s immune system will eventually fail or the tumour will become tolerant to it. We have now researched Genetic Tumour Profiling. This gives a comprehensive view of the tumour profile, at both DNA and protein levels and opens more therapeutic options, supporting my oncologist and follow-up decisions. This is currently not funded by NHS UK for my case, unless I am accepted for a clinical trial. If a mutation is found, then a targeted therapy could be sourced outside of the UK. I would also need to source a private hospital (again outside of UK) to administer any targeted drugs. Very difficult to estimate at this stage, but will include, Tumour profiling, UK Clinic, Non UK Private Hospital Admission, Consultants fee’s, Targeted drugs, Flights/Accommodation. * Chemotherapy: Pharmaceutical licencing directs Oncologist’s which drug to use as a first or second line treatment. Regardless if the order of usage is not appropriate to the type of cancer. Therefore, if their regime is not followed, I will not be entitled to go back to free alternative chemo drugs, even if they work! In the event that I manage to secure the right clinical trial, or the funding is not required, a percentage of it will be donated to Pancreatic Cancer UK, Morriston Hospital Pancreatic Ward, Singleton Hospital Chemotherapy unit and Ward 12 and a small percentage to be retained as security for our children. This has been a truly traumatic time for us and our family, but we know need to keep the motivation going and raise funds to allow more testing to be done to seek a targeted drug that will keep the tumour from growing or spreading. This could provide me with extra years with my 3 children and family. My son’s friend has admirably had an idea to do a bike ride to launch fund raising, which is brilliant! He know’s Brian’s love for all Bikes. This is Bike for Brian on the 4th November from Briton Ferry to Mumbles and back. If you could spare any amount of money – however small – or if you would like to get involved in fundraising, my family and I would be extremely grateful. Please pass this message as wide and as far as you possibly can to bring awareness and support to this cruel disease. We will update this site as often as is needed to keep everyone up to date on my progress. Thank you for taking time to read my story, for your kind messages and thoughts and prayers. Following a stable scan in February, March has been a month of ups and downs. 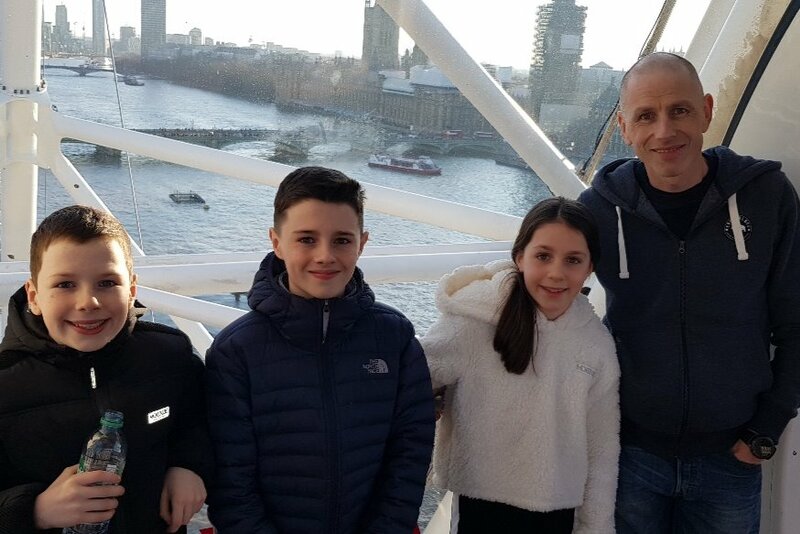 At the end of February, a fantastic charity called “Kicking Off Against Cancer” (KOAC), sent us on a family weekend break to London to make memories. This was a wonderful donation and we had an amazing family weekend. Something we wouldn’t have done without this charity. They arranged everything from transport, accommodation and our sightseeing activities. Brian was fighting off an infection, and I was worried about him going, but he was determined not to miss it. Unfortunately, during March Brian felt unwell again but this time had to be admitted to Hospital, where he was put on IV antibiotics and fluids. He’s recovering ok, but stabilising his weight is still a concern as his body is not retaining nutrients. To add to our worry, an MRI scan has showed 3 additional tumours on his liver. We don’t know when they appeared as the CT scan has not picked this up. But this could impede the decision to have a Liver resection. The next CT scan will determine the next 3 months. We are praying for a stable scan, which will enable Brian to stay on current chemotherapy or allow the Surgical team to decide on Liver surgery or SIRT (Selective Internal Radiation Therapy). If the results are not positive, the NHS will stop chemotherapy and surgery with NHS will be very unlikely. We will then need to source a private consultant to evaluate surgery or obtain the drugs identified in Brian’s profiling. There is limited experience in using these drugs as they are not mainstream treatments, so we will all be entering the unknown. Brian is trying to remain positive and continuing with all his alternative methods of healing, including nutrition, supplements and meditation. He’s also started acupuncture to help with nausea and fatigue. Thank-you all for your continued support. Please keep praying and believing he will get better. A few things going on since last update, Brian has started his new chemotherapy regime which is pretty brutal, spending the first few days in bed with extreme fatigue and nausea, then continued fatigue until a few days before next treatment. However, on a positive note his most recent scan has shown one tumour reduction, with the rest remaining stable!! We are very hopeful that this chemo will continue to respond over the next 6 months so he will endure the side effects and keep going. He has recently received results of his genetic testing, 52 pages of scientific detail, which I am trying to dissect! It seems there are some FDA approved drugs which are suggested to match some of the cancer alterations they detected. They are available to purchase when he has exhausted NHS treatments. The estimated cost of 2 of the drugs is £20,000 per drug per year, other costs unknown at the moment. We have also asked his Oncology team advise on Liver Radiotherapy and Liver resection, which may or may-not be an option with NHS, but could be an option if a private consultant is sought. Again, Thank-you so much for every single donation, we really, really appreciate it. You have now raised £89,000 !!!! Apologies we have not done update recently, but Brian had a setback in December. Unfortunately, Christmas week the scan results showed the current chemotherapy has stopped working and his tumours have continued to grow aggressively. This resulted in his doctor withdrawing the treatment immediately. The plan is to start the last line of UK chemotherapy in the new year, which owing to Christmas holidays, he will not have any treatment for 4 weeks. We’ve spent Christmas as a family, trying to enjoy the holiday period with our 3 children, but I’ve also been beavering away researching for clinical trials. All was looking positive with a trial located in Southampton and appointment booked, but last minute the rug was pulled as Brian has such a rare form of PC that he couldn’t be considered! On a positive note, you are all amazing with support and donations keep coming in. You have now raised an incredible £86,000!!! Thank-you so much for every single donation, to all who've organised, helped and attended charity events, we really, really appreciate it. Meeting genetic consultant for results of first genetic profiling test, and to commence next series of tests. Meeting Oncologist to confirm start date for Chemotherapy. We will also keep searching for clinical trials in the UK and Worldwide, please keep helping us look for this. What an incredible first month! After 4 weeks of this campaign going live we have doubled the initial target of £25,000! We are now at an astonishing £52,000. This is an AMAZING achievement!!! Thank-you so much for every single donation, every message of kindness and support we’ve received from you, we really appreciate it. We met the genetic consultant, discussed all genetic methods to look at. Now we wait for them to test his tumour and get the results (approx. 6-8 weeks). We will also keep searching for clinical trials in the UK and worldwide.